Carillon and War Memorial Museum01509 263370work Museum - MilitaryLoughborough Carillon Tower & War Memorial was built after WW1 to commemorate the men of the town who gave their lives. Unique in Britain, it is the only purpose built carillon tower. 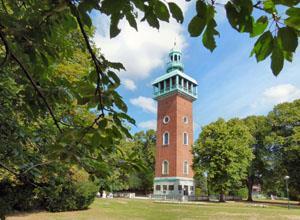 Set within the beautiful Queen's Park the tower is also home to a museum, 3 rooms packed with military memorabilia. Including one room dedicated to the Leicestershire Yeomanry. Loughborough Carillon Tower & War Memorial was built after WW1 to commemorate the men of the town who gave their lives. Unique in Britain, it is the only purpose built carillon tower. The Carillon Tower and War Memorial Museum is open from Good Friday until 30th September, every day except Monday, 1pm until 4.30pm. The ground floor museum is free; adults pay £1.00 (concessions 50p) to access the upper floors, the bell chamber and the balcony. Children can access all areas free of charge but must be accompanied by an adult on the upper floors.